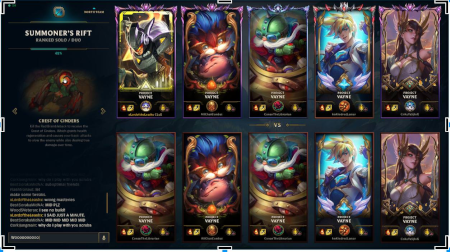 New Loading Screen Update on PBE! For the loading screen, players have been used to the same old thing for many years now. That's all changing as we go into the new season with a brand new face-lift pictured above! You've probably seen our Ranked 2019 video by now and saw a mockup of a part of the new loading screen. 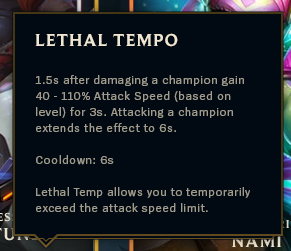 We’re happy to announce it’s coming to PBE today. We need your help testing it out and your feedback to make it better. Make it easier to strategize and plan with your team. Make it easier to size up your opponents and teammates. Clean up the visuals so it’s a little easier on the eyes. Team Chat - Now you'll be able to chat with your team while everyone's loading. Use this to talk about lane matchups, plan an early invade, and get coordinated with your team! No talking to your opponents though, as you can't use All Chat. Voice Controls - While loading, you could ALT+Tab to control voice before, but who wants to do that? Voice controls will now be just a click away, right next to chat. Spell and Rune Tooltips - No need to memorize every rune icon anymore. Now you can hover your opponents’ spells and runes to see more details about their builds right there. We also hope this is a particularly big plus for players just learning the game. Click a champion to see more info - We’re introducing the “back” of the player card as a place to see more details about players and their champions. Click any player to see their honor, ranked armor or level border, and champion mastery. You’ll only be able to see your teammates’ border and icon, not your opponent’s, but you will be able to see your opponent’s champion mastery and honor. 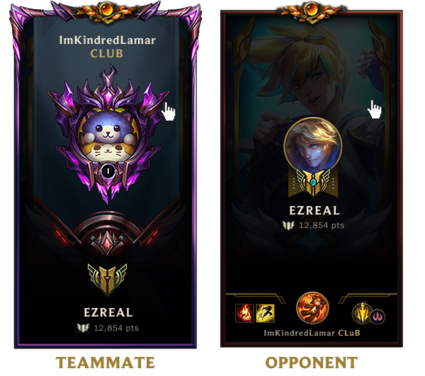 Your summoner name will always be shown in gold and your team will always be at the top so you’re a bit easier to find. We also have a new indicator for which side of the map you’re on in the game header, since we used to communicate this with team position. A new carousel will show gameplay tips, details about events, and lore tidbits with space to show images as well. If you have thoughts about what other content could go in here, let us know! No more hunting around for loading info with a consolidated loading bar in the game header. We also heard you loud and clear that you really valued the personalization and prestige of summoner icons, so we’ve tossed the skin tier gem you may have seen in the Ranked 2019 video and put summoner icon on the front instead. Thank you so much for your feedback so far, and we hope you’ll give us more! We do reworks like this because we really do want to make the game better for everybody, and we listen to you to determine how those changes are working out. We’ll be looking out for your thoughts on the new loading screen and for any issues we see as it soaks on PBE. As a heads up, since this is brand new tech for loading, the possibility of crashes will be a little higher than normal, and we’ll be hunting aggressively for those to make sure the full launch is as stable as possible. Even after launch, this won’t necessarily be done. We’ll be looking for opportunities to make more improvements, and your feedback will be essential to making sure the end result is great for all players. Try it out, let us know what you think!